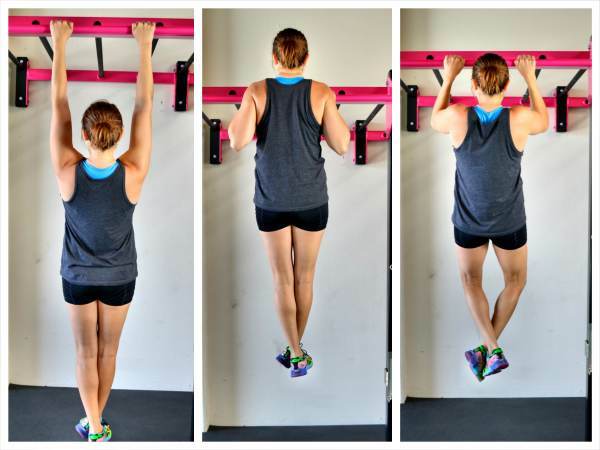 Dead Hang – This move is a great way to work on that initial engagement at the bottom of the Pull Up. It helps you work on scapular retraction and activating your lats right from the bottom of the pull up. To do the Dead Hang, grab the bar with your hands about shoulder-width apart. Your palms can be facing toward you or away. Then hang from the bar with your arms straight. Your shoulders will be a bit raised as you hang from the bar. Press your chest up and out as you draw your shoulder blades together. Feel your shoulders sink down and your neck elongates as you retract your shoulder blades and hold. You should feel your back work as you hang. If you struggle with this, you may need to start with just a basic hang. Pull Up and Hold – The Pull Up and Hold is a great way to work on your lock out at the top of the Pull Up aka getting your chin up over the bar. To do the Pull Up and Hold, set up at the top of the Pull Up with your chin above the bar and your chest pressed out. Hold here with your chin over the bar or even the bar at your chest. Keep your core tight and let your legs hang down as you hold your chin above the bar. Make your back and core really work with this move. Do not let your shoulders start to shrug as you hold. If you start to lose the hold, lower yourself down as slowly as you can and then perform a dead hang for a few extra seconds. If you can’t yet handle your full weight for the hold, lightly touch a foot down to the ground.